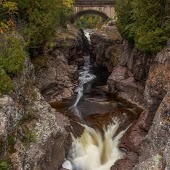 How Can I Go Temperance River State Park? Where is Temperance River State Park in Schroeder on the Map? less "busy" than the parks farther south, but scenery and trails are even better! Beautiful area lake superior at your door. If you're up for a climb(easy, no equipment required) you will be treated to some amazing views. At tofte lookout, and it's absolutely stunning!